You might have seen a big pile of SMS in your iPhone and decided to get rid of the entire SMS in your inbox completely forgetting the fact that there might be some important SMS in that pile of junk that you believe it to be. Well, it has happened with me, I’m pretty sure it might have happened to you as well. 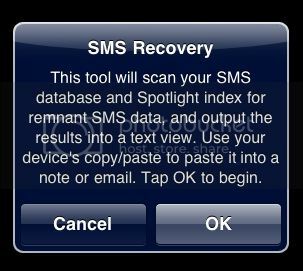 If you have a jailbroken iPhone 4, you can use a tool known as UndeleteSMS that can be downloaded via Cydia. It scans the history for deleted records and it attempts to recover them. The recovered iPhone text messages are displayed in plain text. This is a pretty handy tool but it only recovers deleted data which hasn’t been overwritten by new data. If you use the app on a regular basis you don’t need to wait till the last minute until you are helpless as the data is overwritten. You can purchase UndeleteSMS from the Cydia store for $6.99, under the BigBoss repository. My iPhone Runs Slow, How to Fix?